Choosing to write my paper was an incredibly difficult process. From the beginning, I had planned to do a project which publicized the work my Public History Practicum group was doing this semester. I wrote the pitch for my paper on something I loved because the stakes were low; I wasn’t going to do it anyway. When it came time to make my decision, I felt drawn to it in a way I hadn’t anticipated. The use of queer language is something that I find interesting and it’s something that impacts me personally. I couldn’t shake the urge to follow up on that proposal and so I did what I thought was the unprofessional thing (seriously, who follows their passions when practicality is an option?) and chose the queer project. I don’t think people develop ideas; I think we find them. Ideas come to us or we stumble upon them. If one finds an idea that appeals to them, they can tie it down with language to a piece of paper to be shared. The skill by which the idea is shared is dependent both upon the writer’s skill as a communicator and their care for the subject matter at hand. Not everyone could have written Fight for Identity, and by that same logic if I had done the publicity project instead, I doubt it would have been as good. This project made my heart sing in a way very few projects have before, and it is work by which I am proud to stand. If we put ourselves in positions where we’ll find projects that appeal to us, we’ll do better work. My biggest takeaway from completing this project is: fulfilled and engaged people make better professionals. Interest was the point of origin for this project, but goals and tools shaped it along the way. In our week on scholarly projects, we learned that projects have ends and can be finished. The product eventually changed, but I initially set a goal of constructing a timeline; I would compare the various numeric trends of the NGram graphs to political trends in LGBTQ history. This goal put a limit on what I planned to do and the limited scope of the project would allow me to concentrate on the nuances at hand. At least, this was the first plan. The Google NGram tool did as much to shape the final project as did my personal curiosities. The tool provides data on frequency of use over time which can fuel a quantitative analysis and titles and excerpts from Google Books which lend themselves to a qualitative analysis. This tool didn’t, in the end, provide me with particularly strong evidence tying the literary trends to political ones, but after noticing the trends I did have and spending substantial time with the data, I learned to ask a different question; “what do these trends reveal about the social and political climates in which they were developed and used?” This question, born of curiosity and methodology, eventually led my analysis and guided my paper. I am incredibly happy with the work I’ve done in this class and plan to continue it. I’ve learned a lot about professionalism by taking the chance to do research I thoroughly enjoy and a lot about research by listening to what my tools provided me. Even if my tools provided me with something for which I was no looking in the beginning, it was interesting, regardless. Once I’d finished my analysis and written my conclusion, I found myself wondering about what else these data could tell me. What did these graphs look like if broken down by country? What would it look like to compare straight words against queer ones? And what is the deal with the weird dip in popularity of most queer words after the mid-1990’s? Any of these questions would make for interesting further study and I plan to use my summer research seminar to continue this work. 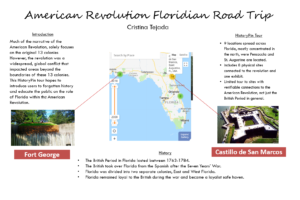 My favorite part about this project was researching sites in Florida that had some connection to the American Revolution and learning how to use HistoryPin to create a tour of these sites. 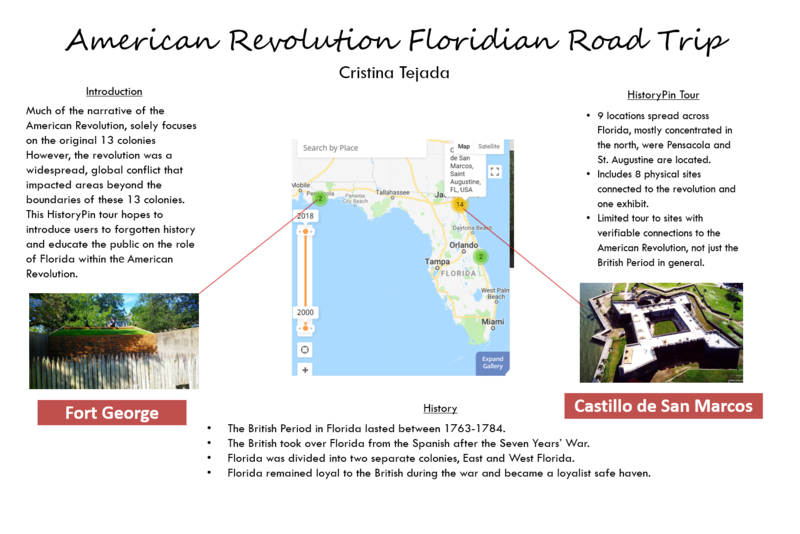 Though I was familiar with some sites and their connection to the American Revolution, I found out about a lot of new information about Florida and the American Revolution that I had never known before, which was really interesting to explore. If I were to continue this project, my next steps would be to continue to contact the various historical organizations that feature in the tour or local historical sociaties that could help promote the HistoryPin tour to a wider audience, especially since not many people know about HistoryPin. I have yet to hear a response from the places that I have contacted but I think it would be interesting going forward to work with these institutions in order to promote revolutionary history in Florida. HistoryPin is currently working or fixing their app, so if/when that is up and running again, I think it would make it easier for people to follow my tour and learn more on the sites that they are visiting. One of the more challenging aspects of creating this HistoryPin tour was selecting which sites to include. While I found many sites around Florida with a connection to the British Period, it was harder than I thought to weed out which sites actually had connections to the American Revolution and which sites were just connected to the British Period in general. Another issue that I ran into when working on this digital project was HistoryPin itself. Before starting the project, I thought HistoryPin seemed very straight forward and I didn’t anticipate much issues. However, I had to figure out many aspects of HistoryPin, such as creating a tour, though trail and error, especially since I did not find their help or faq section particularly helpful. I also ran into issues when I left HistoryPin open for too long and it would sign me out without me realizing or would run very slow. 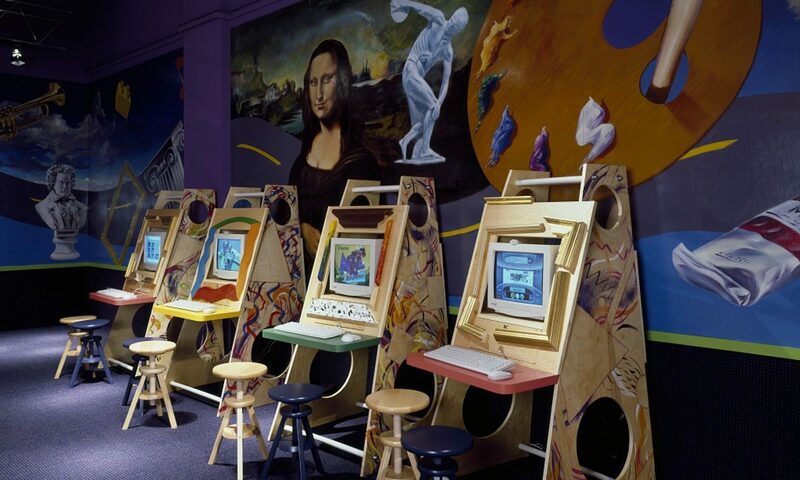 Sometimes the pictures that I would want to use for a pin would come out blurry and it would take about an hour of me replacing the photo until it somehow just worked looked normal. Little technical things like that would be a bit frusterating during the process of the project but it all worked out. Overall, I had a lot of fun working on this project, especially since it allowed me to explore other skills and allowed me to do something other than a paper. This class has offered me the wonderful opportunity to create my own digital project. Inspired by the work I was completing for my Public History Practicum course with National Public Radio, I decided to create a fun digital component to accompany the project. At first I set out to create a Story Map that infused audio with a map of the Middle East and interpretive content. When my practicum group decided to make this tool the center of our project, I had to change gears. In the context of the larger project, NPR was searching for ways to present archival audio content from All Things Considered on their website for students working on projects for National History Day. After evaluating feedback from my project partner Julie Rodgers, a public historian working with the Research, Archives, and Data (RAD) team at NPR, I set out to create a playlist filled with curated audio files and short interpretive descriptions to provide background and context for the 1978 Camp David Summit. There was one huge restriction to meeting this goal for NPR. Since the program All Things Considered conducted numerous radio interviews with outside reporters and news organizations like the BBC, much of their radio content is restricted from the public. In order to work around any clips from the BBC and new stories unrelated to the Camp David Accords, I had to edit the audio. To do this I used Audacity. I have used this program before, so it was pretty easy to cut down the clips and get them saved. All audio chosen had to be cleared by NPR before it was available for use. I am actually still waiting to hear back about a few of the clips. After choosing the audio, I had to figure out the best way to create the playlist. Inspired by a similar playlist format used by the FDR Presidential Library and Museum, I enlisted the help of my classmate and group member, Josh Zampetti, to help me code a simple playlist. He created a basic outline for me using html. Once I had this outline, I was able to use the code editor, Brackets, to edit the playlist and insert interpretive content. Using the code turned out to be my favorite and most rewarding part of the whole project. This was very surprising because I have always said I would never touch code. It was actually really intuitive and understandable once I had the basic outline in front of me. I discovered that all I needed was a little help from google to get everything ready. It was really cool to move beyond my “screen essentialism” and understand what goes into creating the words and patterns on my screen. Hopefully, this new skill will come in handy moving forward and I may try out some tutorials in Python someday! The main difference between my draft project and my final version is the interpretive text. I attempted to incorporate principles from Beverly Serrell’s Exhibit Labels to produce a clean interpretive product. Using these principles I refined my word choice to make descriptions easy for students in grades 8-12 to understand. My text provides a clear description of the audio but doesn’t give too much away. I hope that students will be interested by the descriptions and listen to the audio to learn more. I hope that the presentation of this audio in a playlist format with downloadable links will encourage students to consider incorporating audio into their own projects for National History Day. Audio is an underutilized primary source, and it should become more accessible to students, teachers, and historians alike. This playlist will be attached to a larger project called Breaking the Sound Barrier: Interpreting Audio for National History Day. My group will present this information in a poster session for Public History Day at AU on Monday, April 30, 2018. It starts at 4pm if anyone is interested in taking a look. My group will also be taking this project to NPR headquarters on May 9, 2018 to present to their RAD division. We hope that they will use our suggestions as they plan for next years National History Day. The opportunity this class provided for us to build an entire project based on whatever we wanted to learn is probably the most effective thing a class can do for a student. Not only did we learn to use a digital tool, but in the end we walked away with a tangible deliverable that can be used on a CV or resume, which is exactly young professionals like us need. I wish all classes were like this; a lot of the time I produce papers that are too specific or too contextual to be used as writing samples. With Fireside Nation, I have something that demonstrates a skill that I have that I rarely get to display. Regarding Fireside, I really appreciate the feedback that I received at the poster session. I only wish that it was a real conference, and we had more time to discourse. And I’m not entirely sure I’m finished with this project. I’ve set up meetings for next week to discuss the site with the department head, to receive some possible GIS mapping training, and to also get training in finding funding to continue. Over the course of the semester, I sort of got attached to this project, and I’d like to see it through if it is at all possible. But there are of course problems with it. It would of course need a real server, and not my aging PC. Additionally, the site as it is needs a UX clean up, as it does not function the way I’d like it to. And the site could not start off the way it is conceptualized right now. It would have to be a far more localized site, because a national discussion may be a little too ambitious, and the equipment to handle such a thing would be too expensive. That said, with a serious upgrade to the map, so that it could handle multiple layers of data rather than a simple plot point, this project on a localized scale could tell a beautiful story. The distinction that I tried to relay at the poster session is that this site’s potential lies in its ability to carry out hundreds of interviews at one time; as I’ve mentioned, it does not follow oral history best-practices, but it does have strengths that can be considered a trade-off. If you’re an interviewer trying to tell a story about a particular space, think of the advantages of crowdsourcing your interview! When I first thought of creating American University Project Plaque as my digital project, I initially saw it as a way to kill two birds with one stone. The Archives of American University asked for a master list of all of the plaques on campus and I saw this as an opportunity to create a digitally curated collection. While I did not know how many to expect, I’m glad I set limitations of collecting plaques outside and on the main campus. As of today (April 26, 2018; approx. 4:15 PM) this collection houses the information for 64 plaques on an Omeka site. All of the plaques have been transcribed and include their exact latitude and longitudinal coordinates. In addition, all plaques have been uploaded to Wikimedia Commons and are linked to the collection. If I continue this project in the future, I would create smaller collections for all of the plaques within specific buildings and then on the additional campuses, the Washington College of Law and Spring Valley. In line with the ideas of Kirschenbaum, this project is “done;” however, I look forward to continuing this work in the future. As a certified arboretum, American University must have all plant life labeled with their genus and species. However, I found these two to also have dedications to women who have passed away. While these are the only two that caught my eye, it would be interesting to find more! I never knew this about AU, so it was cool to learn! I truly enjoyed working with American University Project Plaque and learning more about my campus. Throughout this semester, I have learned what it means to be a Digital Historian and I am glad to say that I am one–sorta.